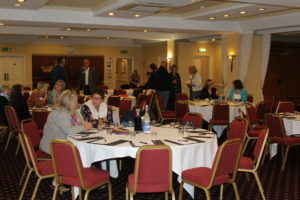 This year, our annual Partners Day took place at The Gables Hotel, Falfield on Monday 2nd October. 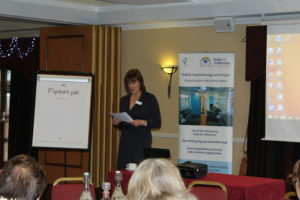 Partners Day is an annual event we hold, with an aim of bringing our NHS Partners together in one room to share their experiences of running a Mobile Chemotherapy Unit (MCU) as well as having the opportunity to trouble shoot, share ideas, regimens as well as new ways of developing their units. We have guest speakers throughout the day – this year’s included Hope for Tomorrow Chair Dr Sean Elyan, Medical Director and Consultant Oncologist at Gloucestershire Hospitals NHS Foundation Trust, East Kent Hospitals and The Royal Marsden NHS Foundation Trust (our latest partnership), who discussed various aspects of the MCU as well as giving attendees the opportunity to ask questions. Past attendees have included oncologists, nurses, drivers, pharmacists and MCU administrative staff. Having such a mixture of staff means that discussions are broad and people are in a comfortable environment, prompting them to ask any questions they may have. The day allows potential NHS partners to meet with Trusts who are already operating a unit and gain a real insight of the benefits of having a MCU as a part of their oncology service. We had a ‘second generation’ MCU on site where they could see the developments we have made to make the patient and nurse experience more comfortable. This gave potential partners the chance to have a tour on board and experience its comfortable environment. The day also allows HFT charity staff to learn from those operating the units and look for ways of improving the offering we give to the NHS Trusts.